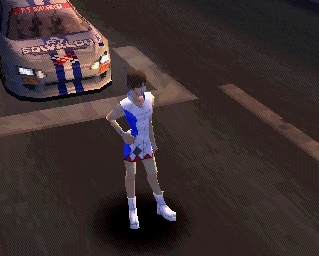 For a long time, it seemed no driving game could touch Ridge Racer. An instant-hit on launch day, and by the time Revolution and Rage followed in 1996 and 1997, Namco had created a brand that was akin to racing royalty; a defacto champion of its genre, in much the same way Crash Bandicoot was to PlayStation platformers and Tomb Raider was to adventure games. But then Gran Turismo burst onto the scene, and suddenly things were different. 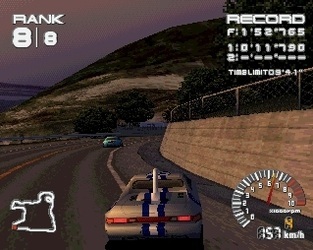 More substantial than Rage Racer in almost every way, this self-proclaimed ‘real driving simulator’ was enough to leave Ridge Racer trailing in its mirrors. 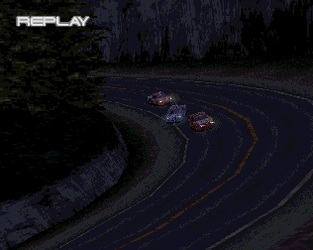 Whilst the emergence of GT would undoubtedly have serves as a wake-up call for Namco, the stark truth for Ridge Racer was that by 1999, it had been overtaken not only by Polyphony Digital’s masterpiece, but also Codemasters’ twins TOCA and Colin McRae Rally too in the meantime. Still, it became quickly apparent that Namco weren’t leaning on past glories. A steady stream of stunning screenshots, a gigantic checklist of content, eye-popping demos and delays meant that come release day, the hype been R4 was immense. Could it really do the impossible and take back its racing crown from Gran Turismo? The introductory video sets the scene with bombastic aplomb, showing off a street race with lurid slides, streaky light effects and curves ‘n’ colour schemes that oozed class. Its presentation is radically different from previous entries, ditching the bright, arcade looks and replacing them with stylish, less bold menus but eminently stylish orange menus that are as much art-gallery as option lists. Whilst it offers a couple of tertiary game modes, you’ll spend nearly all of your time on the Grand Prix mode. It takes the guise of a narrative-led season whereby you can choose to compete for one of four teams, ranging from easy to handle Mappy cars that make winning a breeze, to fallen giants DIG with their under-financed, underpowered cars. In addition to each of these teams, you can then choose one of four manufacturers, who make the cars. Two adopt drift characteristics encouraging powerslides, whilst two are more grippy, but their vehicles all have very different looks and performance. The idea is to progress through eight races by finishing in high positions, but the twist is that depending on your results, you will get different reactions from your team boss and consequently, different cars. Between these and the varying, in-depth pre/post-race reactions from your team boss means replaying the Grand Prix is a pleasure rather than a drag. Win every race and you will be rewarded with the best car there is, but if you want to collect all 321 cars you will need to think about forfeiting certain victories in order to unlock other cars. Most distinct about the R4 experience is its handling. A shade less perfect than Rage Racer perhaps with its slightly more sanitised slides, the tracks nevertheless retain the spirit of previous games, whereby a positive, aggressive driving style usually pays dividends. Recognising the slide mechanics may not be everyone’s cup of tea, the developers have added 'grip' cars - nippy handling vehicles that stick to the road like glue and deliver an easier if slightly less enjoyable drive. In the simplest of terms, R4 is the best looking game ever to grace a PlayStation. Every track is an absolute work of art, each with their own distinct landmarks and characteristics that make them stand out. You can often see for hundreds of metres in front of you; there’s no pop-up, tearing, slow-down, or any kind of technical fallibilities whatsoever and despite the often-blistering pace of the action, the silky smoothness is constant. The tracks are an absolute joy to race on - each challenging and memorable in their own way. 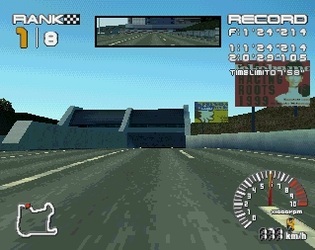 The best moments include a terrifying slalom-esque descent through chicanes/jinks on the circuit ‘Wonderhill’; ‘Edge of the Earth’, the first night-time track, shows off some stunning lighting and reflections as well as rows of neon-drenched casinos and hotels; ‘Out of Blue’ allows you the pleasure of cruising past a gigantic ship docked in a harbour; ‘Brightest Nite’ not only has jumbo jets taking off and landing over the start/finish straight but is home to an incredible jump where your car leaps over a crest and for a few seconds you are airborne, looking down at a pool of lights that forms city in the distance. Finally, ‘Shooting Hoops’ is/was set just before the turn of the millennium and as you enter the final lap, you’re greeted with a fireworks display. This attention to detail and complete, utter technical mastery elevates it above other racers; it’s one of the most visually impressive games there’s ever been. If the graphics are the games strongest suit, then the audio is perhaps its weakest. It’s silly to call them weak really, because the dance tracks that accompany the racing are decent, though comparatively low-key sound effects (particularly the screech of sliding tyres) mean this aspect of R4 isn’t as special as the rest of it. The split-screen two-player mode is a series-first, and it’s pretty good too. It looks superb and maintains a great deal of speed and detail, although the sacrifice is that there can only be four cars on track at a time. Special cars can be unlocked in Extra Trial mode, where you race in a one-on-one situation with the computer who happens to be in a special model. If you can beat it (no mean feat) you will be awarded with your opponent’s car, of which there are four in total - one for each manufacturer. The best - the rocket-powered Utopia, does 400kph, plus makes a rather alien sound on acceleration. Out of this world? You bet it is. The racing element is extremely good, thanks in large part to some fantastic courses. The computer-controlled cars are a little disappointing though, as they are very spread out, you will never get to race more than one at a time and collisions with them or the scenery remains very naff. It doesn't spoil the fun too much, although you will hold your breath when trying to overtake in a corner. Ridge Racer Type 4 proved a phenomenal effort from Namco, and arguably to this day, is the most complete entry in its illustrious lineage. Whilst it’s generally considered that Gran Turismo remained the more influential title, R4 bettered it in terms of graphical finesse and sheer enjoyment, and it is still the slickest, classiest PlayStation racer in history. "Namco weren't leaning on past glories. A steady stream of stunning screenshots, a gigantic checklist of content, eye-popping demos and delays meant that come release day, the hype was immense"